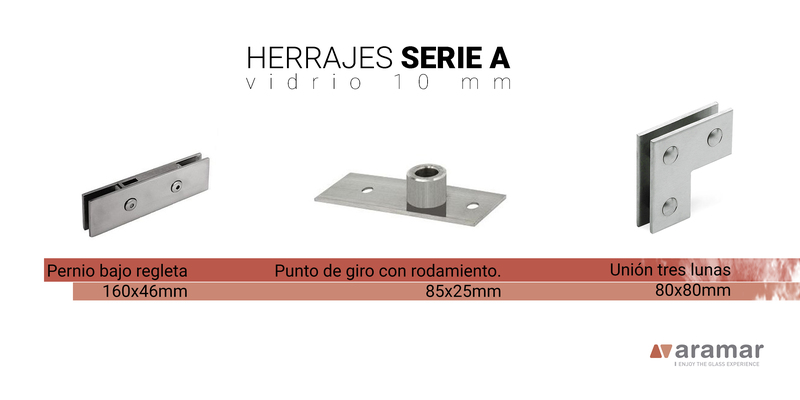 The fittings are accessories that allow the operation of different elements such as doors or windows. For this reason, professionals in the sector seek quality and guarantee in these products, as poor quality will prevent the correct functioning of vital elements in the organization and functioning of a home. In Aramar we are aware of this need, so in addition to providing you with a quality product that meets the required standards, we try to offer you the best advice for each situation. One of our most outstanding fittings is located in the A Series. It is a set of hinges, pivot points and joints manufactured in-house, complying with the quality that characterises us. Such is their quality that we are pleased to be able to say that they have a zero percentage of incidents: customers who have used these products have been satisfied with their performance. You can also find them all in different finishes: glossy stainless steel and satin stainless steel. Available with 1 or 2 holes. Glass clamping plates made of 4mm sheet metal. Running in for doors, gates, etc. Available as a set or as parts. It is used to anchor the glass to the wall.